Adura Max | PriceCo Floors, Inc.
PriceCo Floors is a proud Elite Adura Max dealer and excited to offer quality products at affordable pricing for our customers. Call us at 301-317-6220 for best pricing or visit our showroom to see Adura Max samples. Adura Max is made with the innovative HydroLoc™ waterproof core—making it the ideal choice for basements, baths and other challenging areas. Thicker and more rigid than traditional vinyl, Adura Max can be installed on all levels of you home and installed directly over most existing floors and subfloors. With locking planks that include Ultra Quiet attached pad, this material is not only easy to install but provides sound reduction and a more comfortable floor to walk on. 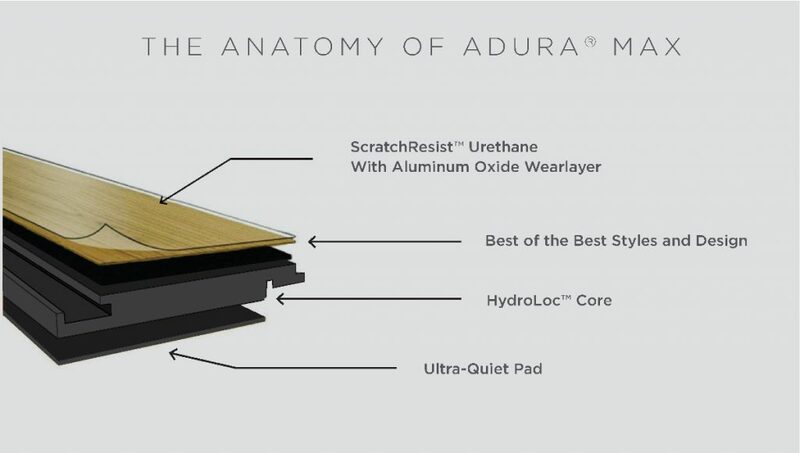 With an aluminum oxide surface protection, Adura® Max can stand up to the most active households and offers the industry’s best wear, scratch and stain resistance. A stress-free limited, lifetime residential and 10-year light commercial warranties against wear through, staining, fading, delamination and joint separation is included with any purchase of Adura Max products. Available in a multitude of colors and style you are guaranteed to find a product to fit your ideal design. Have been certified to the FloorScore® IAQ standard. Save $100 when you purchase $2,000.00 on your complete flooring project. Cannot be combined with any other specials or offers. See store for details.